Kinesio® Tex Gold tape is pre-cut and packaged into functional shapes and sizes. Dimensions: 12" x 1" x 8"
Kinesio® Pre-Cut Neck Support is designed for neck pain caused by muscle strain or ligament sprain. Each packet contains a single-use, customizable set of tape strips and instructions. Each Neck Support application comes with one black I-strip and two beige Y-strips cut from genuine Kinesio® Tex Tape Gold. 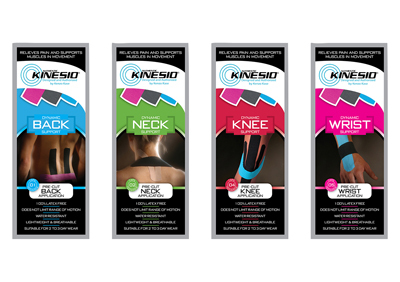 Kinesio® Pre-Cut Shoulder Support is designed to provide support for shoulder muscles, treat rotator cuff injuries and relieve shoulder pain. Each packet contains a single-use, customizable set of tape strips and instructions. Each Shoulder Support application comes with one black I-strip, one blue I-strip and one blue Y-strip cut from genuine Kinesio® Tex Tape Gold. Kinesio® Pre-Cut Wrist Support is designed to provide support for carpal tunnel syndrome, provide wrist support and alleviate associated pain. Each packet contains a single-use, customizable set of tape strips and instructions. Each Wrist Support application comes with two black I-strips and one blue I-strip cut from genuine Kinesio® Tex Tape Gold. Kinesio® Tex Gold tape is pre-cut and packaged into functional shapes and sizes. Starter set includes once function set each of tape for the: lower back, neck, shoulder, knee, wrist, and foot.